In early March at a hotel in downtown Denver, delegates for Western governors were handed paper copies of a Bureau of Land Management draft instruction memo on how to ensure cattle grazing does not harm habitat for the greater sage grouse. The draft document caused a stir for some members of the state-federal Sage-Grouse Task Force, who are working closely with the Obama administration to ensure that the bird, which narrowly avoided an Endangered Species Act listing, can thrive alongside public lands users, including thousands of ranchers. The memo and an attachment described how BLM might respond if domestic cattle were found to gobble up too much of the grass that grouse need to hide their nests from predators. BLM might consider delaying or shortening grazing seasons or allowing fewer cows to roam the range, it said. "We have concerns over how they are written and what they could mean for ranchers in Idaho," said Dustin Miller, a top natural resources aide to Idaho Gov. Butch Otter (R), whose administration is challenging BLM's sage grouse plans in a federal district court in Washington, D.C. Greater sage grouse. Photo by U.S. Fish and Wildlife Service, courtesy of Wikipedia. The memo, which Greenwireobtained from a separate source, is one of several guidance documents BLM is developing that will clarify how it implements new sage grouse land-use plans governing grazing, oil and gas drilling, mining, renewable energy and other activities across roughly 50 million acres in 10 states. As reaction to the draft grazing memo suggests, there will be some discord along the way. BLM is hosting several internal and external meetings this month and gathering feedback from task force members to try to smooth out concerns. Interior Department officials said edits are being made and final guidance documents are due for late spring or early summer. "These early draft Instruction Memorandums (IMs) are not currently in use and the BLM expects them to change and in some cases significantly, based on feedback gathered over the next several weeks from workshops and informal, internal and external input,” said Interior spokeswoman Jessica Kershaw. 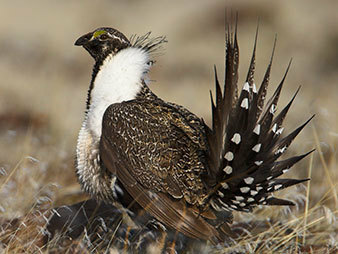 The land-use plans BLM finalized last September were a key step in ensuring that the Fish and Wildlife Service did not have to list sage grouse under ESA. The new guidance documents are designed to ensure that the plans are implemented consistently and effectively by BLM's field officers so grouse populations remain robust. FWS plans to revisit the bird's status in five years. "Right now, it's a lot of all paper birds and paper habitat until we actually see these management actions manifest on the ground," said Ed Arnett, a wildlife biologist for the Theodore Roosevelt Conservation Partnership. "That's why implementation is so critical. The Fish and Wildlife Service really did make a [listing] decision based on future activities." The way in which the instruction memos are written could also have big ramifications for ranchers, oil and gas drillers, and other public lands users whose activities can disturb grouse. Top Interior officials in recent weeks have met with BLM field staff in several states as well as Forest Service, Fish and Wildlife Service, U.S. Geological Survey and Natural Resources Conservation Service personnel to seek feedback on how to implement the plans. This week and next, BLM is hosting stakeholder workshops in Grand Junction, Colo.; Cheyenne, Wyo. ; Billings, Mont. ; Salt Lake City; Reno, Nev.; Boise, Idaho; and Bend, Ore., to discuss how the grouse plans will be implemented at the ground level. Major themes at the workshops will include adaptive management, grazing, mitigation, oil and gas drilling, and surface disturbance. "Implementing the plans is going to be just as challenging, if not more challenging, than writing them," said Sarah Greenberger, a key adviser to Interior Secretary Sally Jewell on sage grouse. BLM is hosting the stakeholder workshops even as it fends off lawsuits by Western states, counties, miners and ranchers that seek to undo the plans and as House Republicans push legislation to give governors the authority to essentially veto them. Just yesterday, the American Exploration & Mining Association filed a new lawsuit challenging the plans in the U.S. District Court for the District of Columbia, alleging that the BLM and Forest Service plans unlawfully restricted mineral exploration on millions of acres of federal lands in California, Idaho, Montana, Nevada, Oregon, Utah and Wyoming and failed to provide adequate public comment.